The USGS assesses active and potentially active volcanoes in the U.S., focusing on history, hazards and the exposure of people, property and infrastructure to harm during the next eruption. The assessment uses 24 factors to obtain a score and threat ranking. The findings are in the newly published 2018 Update to the U.S. Geological Survey National Volcanic Threat Assessment. The threat ranking is not a list of which volcano will erupt next. Rather, it indicates how severe the impacts might be from future eruptions at any given volcano. 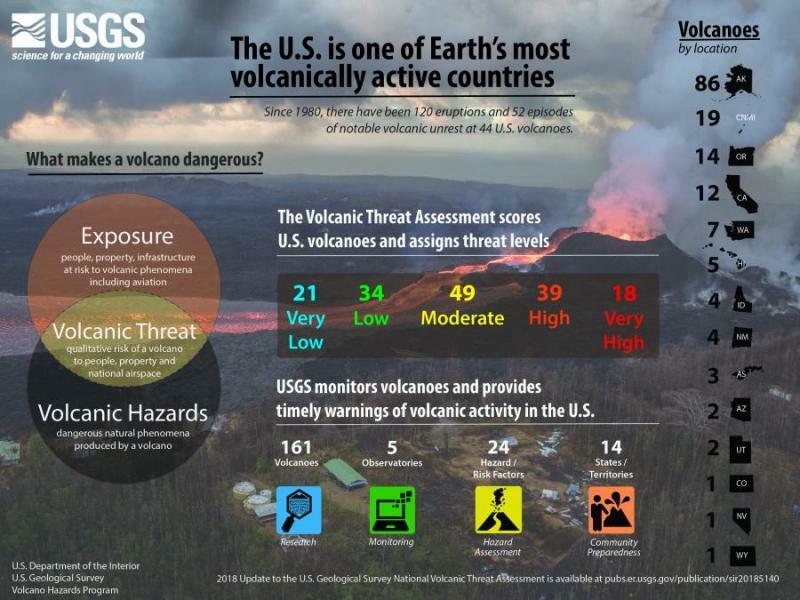 The volcanic threat assessment helps prioritize U.S. volcanoes for research, hazard assessment, emergency planning, and volcano monitoring.